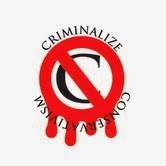 Criminalize Conservatism: Who Said Conservatism Is Gangsterism? 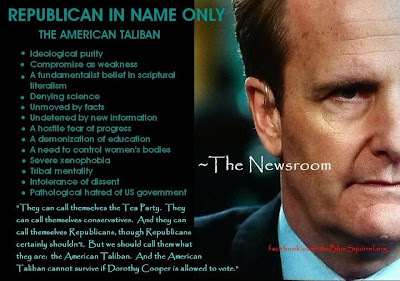 Who Said Conservatism Is Gangsterism? Who said the Cons Are Gangsters? Does the answer have anything to do with class warfare? Short answer, it was us. "The Kochs: the greatest American criminals of the last century." "I am not fan of the Koch brothers but I have to admit that this article in Rolling Stone floored me. It is stunning what Charles and David Koch have done over the last half century, stealing from everybody who had a dime in their pocket, including their own family. I have tried to think of a criminal enterprise that has engaged in such disreputable behavior and even the famed vampire squids seem to pale in comparison. They are evil incarnate. There is no way to identify with who these two men are, what they have let themselves become. They seem to have absolutely no redeeming values. "I begin to think letting these men buy our government is like letting the Sopranos buy our government. Except even a thug like Tony Soprano had some redeeming values - he protected his neighborhood, he protected his family. Not so the Koch brothers. They care about their money and nothing else. You could not sell a script about what the Kochs have done because you need to have something that the audience can feel a connections for. There is nothing in the world of Charles and David Koch. They are moral cretins beyond the breadth or our imagination..."
"Inside the Koch Brothers' Toxic Empire." "The enormity of the Koch fortune is no mystery. Brothers Charles and David are each worth more than $40 billion. The electoral influence of the Koch brothers is similarly well-chronicled. The Kochs are our homegrown oligarchs; they've cornered the market on Republican politics and are nakedly attempting to buy Congress and the White House. Their political network helped finance the Tea Party and powers today's GOP. Koch-affiliated organizations raised some $400 million during the 2012 election, and aim to spend another $290 million to elect Republicans in this year's midterms. So far in this cycle, Koch-backed entities have bought 44,000 political ads to boost Republican efforts to take back the Senate. "What is less clear is where all that money comes from. Koch Industries is headquartered in a squat, smoked-glass building that rises above the prairie on the outskirts of Wichita, Kansas. The building, like the brothers' fiercely private firm, is literally and figuratively a black box. Koch touts only one top-line financial figure: $115 billion in annual revenue, as estimated by Forbes. By that metric, it is larger than IBM, Honda or Hewlett-Packard and is America's second-largest private company after agribusiness colossus Cargill. The company's stock response to inquiries from reporters: 'We are privately held and don't disclose this information...'"
"John Birch Society Celebrates Koch Family For Their Role In Founding The Hate Group." "Billionaire brothers David and Charles Koch have been dominant financiers for conservative front groups and nonprofits for nearly three decades. Their money has flowed to organizations dedicated to lobbying for corporate and upper income tax cuts, as well as to groups responsible for mobilizing Tea Party rallies against President Obama. But the Koch family’s association with fringe right-wing groups began a generation earlier with Fred Koch, the patriarch of the clan. "Fred not only founded the company now known as Koch Industries, he also was a founding member of the John Birch Society. As a founding board member, Fred helped engineer a hysterical wave of attacks on labor, intellectuals, public education, liberal clergy members, and other pillars of society he viewed as a threat. Birchers decried everyone from former President Eisenhower to water utility administrators as pawns in a global communist conspiracy. 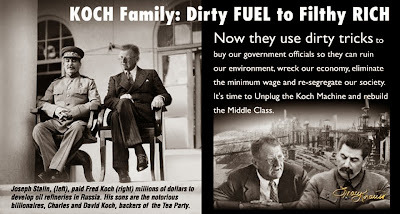 In the last two years, as the Koch name has become synonymous with right-wing plutocracy in the United States, the Koch family has played down its relation to the Birchers. "Koch warned that American institutions were honeycombed with communist subversives, from labor unions and tax-free foundations to universities and churches. Art and newsprint, radio and television — all these media had been transmuted into vehicles of communist propaganda. [...] Fred Koch was no fly-by-night pamphleteer. He spent a generous portion of his later years using his wealth and influence to fight the communism he abhorred. He was an early member of the The John Birch Society’s National Council, an advisory group to JBS founder Robert Welch. Koch supported a variety of freedom-related causes, all the while continuing to build the company today known as Koch Industries." "The Bircher ode to Koch glosses over Fred’s record of bigotry. In a booklet he authored, Fred railed against civil rights leaders, and claimed the movement against racial segregation was a communist plot to use African Americans to destabilize the country. The Koch-funded Birchers held numerous rallies during the ’60s claiming integration would lead to a 'mongrelization' of the races..."
This is who they are and the meme above explains what they and the American Taliban are all about. Absolute power corrupts absolutely and we need to confiscate their assets and income redistribute their income. This goes for others like Sheldon Adelson and those Cons in our world with way, way too much money. Why doesn't the voter get it? Because he's swayed by the mercenary Conservative propagandists that pollute their Sheeplets' minds with fear, then turn them to hate. Criminalizing Conservatism will take care of the capos like the Kochs and Adelson, and when they are hauled into court we'll see if monetary penalties can't redistribute their obscene wealth in a totally different direction -- towards the 99 percent of us that have had our livelihoods and dignity destroyed by them and their greedy billionaire pals.